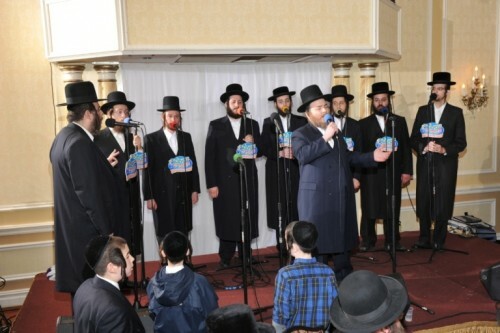 Brooklyn, NY — In what many described as the largest turnout ever for a life-saving beacon of chessed, thousands of Williamsburg residents jammed into the Ateres Avraham Hall this past Tuesday evening to lend their support to the amazing work of RCCS, the Rofeh Cholim Cancer Society. Every nook and cranny of the largest hall in Williamsburg was crammed with well-wishers, donors, and askonim, with the overflow listening and watching on video screens placed throughout the building. The dinner attendees were especially charged to hear warm words of chizuk from the Chief Rabbi of Antwerp, Rabbi Aharon Schiff, who flew in especially for this evening. As is well known, RCCS provides a vast array of services for cancer-stricken patients in need, primarily subsidizing their health insurance premiums, thus allowing them access to the best possible medical care. Feted at the event were Dr. Chandu Patel, noted Williamsburg pediatrician, the volunteers of Chesed of Williamsburg, who provide tens of thousands of rides each year to and from hospitals, and several other noted community activists. A highlight of the evening was provided by singer and badchan, Pinky Weber, who regaled the audience with tears-inducing words of poetry, followed by a thematic song, accompanied by Yisroel Werdyger and the Hamizamrim choral group. Inspiring speeches were also delivered by RCCS founder and president, Reb Hershel Kohn, and by noted singer, Yonasson Schwartz, who spoke of his first-hand knowledge of the life-saving work of RCCS. Topping off the inspiring evening was zemiros by Shragy Gestetner, accompanied by a magnificent child soloist, Hershy Mittleman. The thousands of attendees all left the hall with the sounds of Tehillim resounding in their ears, praying for an end to all sickness within our midst; may that day come speedily.